The major averages climbed off their worst levels going into the close but remained firmly negative. The Dow tumbled 558.72 points or 2.2% to 24389. The sell-off came after the closely watched NFP report showed US employment increased by much less than expected in the month of November. Following the slew of US economic data released over the past couple days, the economic calendar for this week is relatively light. Traders are still likely to keep a close eye on reports on retail sales, industrial production, and producer and consumer price inflation. 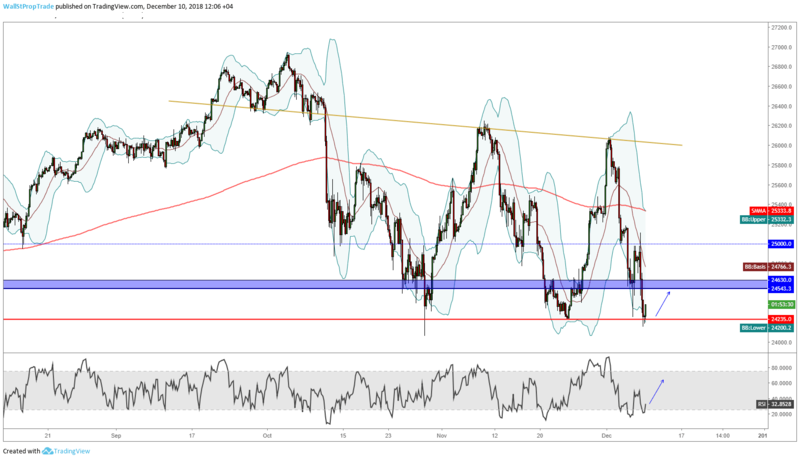 After trading down to 24285 earlier during the day last Friday, the market bounced off the key technical support level at 24235 and is set for a correction back to the resistance zone between 24543 and 24630 as the RSI indicates extreme oversold conditions. However, this change in momentum could be temporary as the trend is still clearly bearish and as prices approach October's lows at 24122. Therefore, we could see further downside momentum in the medium term.